The latest luxury business hotel in Makati with an all-day dining restaurant is now open, ­Discovery Primea, an icon of luxury rises. The Discovery Leisure Group proudly unveils Primea, its newest luxury hotel property for the corporate and leisure travelers. A soaring 68-story structure towering along Ayala Avenue’s prime apartment ridge is home to 141 Rooms and Suites, together with 90 luxury serviced apartments offering breath-taking vistas of Manila’s skyline. Primea stands tall as a graceful synergy of design excellence through the collaborative efforts of leading architectural firms, Tange Associates (Tokyo) and Jorge Y. Ramos & Partners (Manila); the design firms Texiera, Inc. (Los Angeles), Anna Sy, DWP-Design Worldwide Partnership (Bangkok/Hong Kong) and landscape designer Paulo Alcazaren. It prides itself in providing relevant luxuries to business and leisure travelers through its accommodations and six restaurant outlets which include the newly opened TAPENADE, an all-day Mediterranean restaurant. Travelers will enjoy the luxury of space in the rooms and suites. 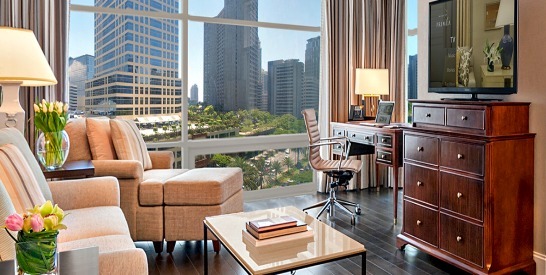 The Business flats average 40 sq.m, Business suites average 53 sq.m while the 1-bedroom Executive Suites offer 71 sq.m. of floor space. The larger suites such as the 2-Bedroom Primea Suites offers 76 to 94 sq.m of space, and the Primea 2-bedroom lofts averages 125 sq.m are suitable for long stays or families. The Primea Premier, the hotel’s equivalent to a Presidential Suite is the most coveted accommodation with 200 sq.m of living space. Relevant luxuries are found in the rooms such as High-speed internet access for multiple devices, In-room Safes, iPod and iPad docks, Internet Protocol Television (IPTV), Nespresso Machine, 46” LED TV, Pillow Menu, a Refreshment Center with Coffee and Tea Facility, Mini-bar, 19” LED TV in the bathroom, Hair dryer, and Premium Bath Amenities. The 2-bedroom and 1-bedroom suites also come with a Fully-furnished Kitchen, Induction Cooking Range, Full-sized Refrigerator, Glassware, Microwave Oven, Toaster Oven, Washer and Dryer, and Dishwasher. Discovery Primea soft opened in February 2015 and is the latest hotel of The Discovery Leisure Company, Inc. as well as the first independent hotel in the Philippines to be listed in the Preferred Hotel Group’s Summit Brand.